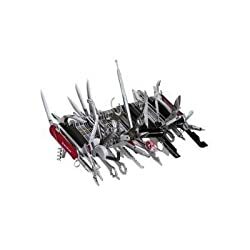 Wenger 16999 Swiss Army Knife Giant First of all, let me tell you a little about myself and how I came to need such mystical tools of survival. I woke up after my amazing night's rest in the Wenger's king size murphy bed (with satin sheets). Once the women were dressed and out the door, I made coffee from the Wenger's cappuccino machine. Then I headed out the door, Wenger in hand.